Garden Projects? Give us a call! Garden looking tired? Need new decking? 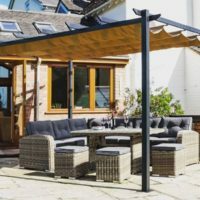 Your garden is an ideal place to sit and relax with garden furniture from our Rowlinsons or Hutton garden ranges. Then relax, select from Rowlinsons or Forest garden ranges of products. You can phone, email or Order Online and we will take it from there. Western Red Cedar timber cladding has become increasingly popular for adding extra character to existing buildings and cladding timber framed structures. Whether you have a self build, loft conversion or house extension there is a Western Red Cedar cladding option for you. More time is being spent in the garden for entertaining and demand has increased for garden products. 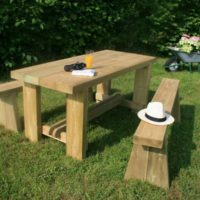 We have probably the largest stocks and most extensive range of timber, furniture and garden structures in Devon. By the way, if the grass is showing signs of wear and tear we also stock Namgrass. All of their artificial grass is manufactured in Europe and delivered to most parts of England and Wales. Our stocked products are primarily a range of four tanalised Premier sheds. We can source larger sections of structural timbers mainly French oak, Douglas fir and larch machined for bespoke buildings. The logs are cut to length, usual lengths are 3.6m, 4.8m and a maximum of 7.4 metres. Most timber is cut to size but some finishing will have to be completed by the customer. Lead times can vary so please do not leave until the last minute before ordering. Quick-Step are flooring specialists and they produce solid wood, laminate and high-quality vinyl flooring. With the backing of the parent company Unilin they produce a massive range of flooring options. By combining different lengths, widths, colours and finished we can supply a floor for almost every flooring installation. Premier deckboards head our softwood decking range which includes 100mm and 125mm width boards. 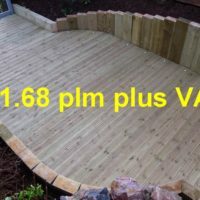 Included are smooth and profiles boards along with anti-slip decking. HardiePlank® cladding offers many of the aesthetic benefits of natural wood with the low maintenance durability of fibre cement. Southern Timber are the Premier stockist for James Hardie cladding & backer boards in Devon and Cornwall. These composite Millboard deckboards feature an anti-slip Lastane surface layer. The boards do not rot, warp or splinter and come in a choice of designs & colours. Millboard is equally suitable for domestic or commercial applications.